More lovely container garden ideas, inspiration and recipes. Lovely container garden images and plant combinations from thriller plants to spiller plants and filler plants and everything in between. What time would that be, Lynn? Well silly, it's time to get our Container Garden ideas on paper, planned and planted…of course! I am continuing my quest to document Container Garden ideas as I come across them. I'm beginning to think of myself as the Julia Childs of Container Garden recipes. Now I just need to get her accent down and I'll be all set. But seriously, if you are like me the warming of temperatures naturally forces your mind to consider how you will create your container gardens for this spring and summer, among other spring-y type considerations. This is the third post I've done over the year showing some Container Garden Ideas, Inspiration and Recipes. Pop over here and here to see the first two. Full disclaimer: I am not even close to a horticulturalist…so…I can't claim that I'm 100% accurate of my identification of these plants or plant combinations. However, I do think I came pretty close to get the desired effect, which is all I'm really after anyway. This first pot includes some of my go-to plant combinations for container garden recipes and is great in a partly shady area. I love the contrast of the dark and moody blacks against the almost electric greens. 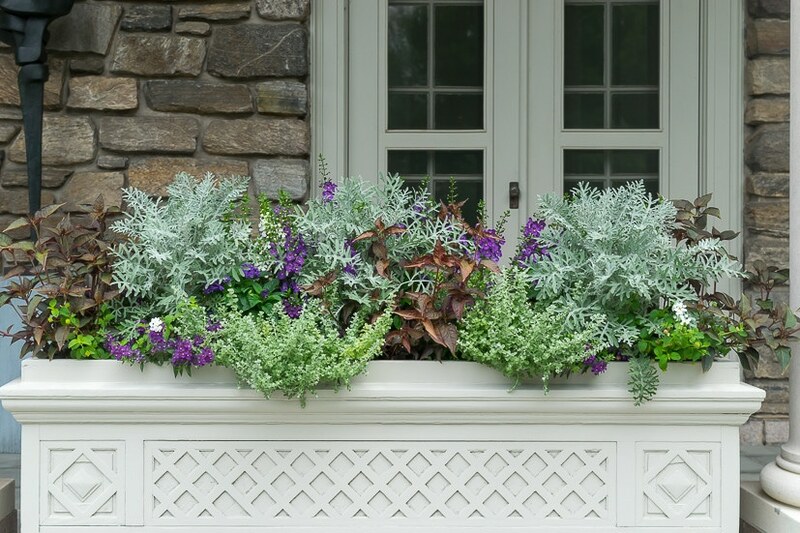 This long planter box, with it's softer and less dramatic plant colors and textures, is perfect against the stone of this home. In homage to Prince and any other Purple-lovers out there…this container pot will do well in most light situations, from partial shade to full sun. You can never go wrong with the plant combination of Classic Red Geraniums and Variegated Vinca Vines. It surely doesn't hurt to have a rusty bike and a brooding bust in the background either! I like the contrast between the soft pinks and gray/greens against the dark sweet potato vine and sedum. And for just the right spot, this flower-filled wagon is full of fun and whimsy. We get most of our plants from our local Home Depot. They have an extensive variety of thrillers, fillers and spillers from which to choose to create your own “recipe”. They have a wonderful program by which you can Order Online Here and pick it up at your local store within hours or at your convenience. Helpful Hint: If you have really large pots for your container garden idea, consider filling at least a quarter of the way with gravel or bricks if you don't have to move the pot. If you need your pot to be lighter, consider empty water bottles with the lids on, styrofoam or empty plastic pots. Have you started planning out your Container Garden recipes for this spring and summer? Do you have some favorite plant combinations? What are your “go to” thriller, filler and spiller plants? Do tell! And if you are just starting the ‘hmmm…what-should-I-do-with-my-Container-Gardens' process…pin this for your future reference. Thanks so much for stopping by to visit today; I appreciate it more than you’ll ever know. And when you leave a comment…ah, it makes my heart sing! If you want to see what I’m up to from week to week, sign up here to sign up for updates. I have published printable PDFs of several of my most popular knit patterns and other printables and have made them available to all of my subscribers. Come back and check every now and again. I will continue to add patterns and printables to this page as we go along. Well, has Spring sprung? We are in the 80s today, but dropping to 40s on Friday…it’s that time of year when the weather is so changeable. But you can start planting ideas for your container gardens! Keep faith Dolores! Spring is coming!